It’s late September and the days are still full of sunshine. I’m at home enjoying the latest edition to our family: daughter Sophie who is now 12 weeks old. 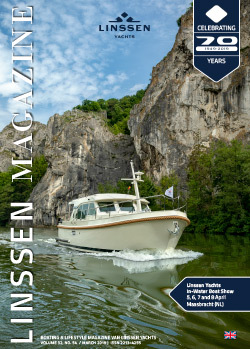 With the sun shining on the terrace, I am looking at messages and splendid photos on Facebook from Linssen owners who are still soaking up the nice weather on the water. I like to see others enjoying our yachts. I am browsing the contents of this edition again. Before Sophie was born, Paul Beelen and me had already decided on the contents, in outline at least. After all, its difficult to determine the latest news in June. I can see what I’ve been missing, or should I say following from a distance. But needless to say, spending the first few weeks with our daughter was a priority. Because let’s face it, this is a once-only opportunity. Nevertheless, I do regret having to miss Linssen events. One of the events I missed was the introduction of the Classic Sturdy 36 Sedan Deckbridge at Nasta Marine in Estavayer-le-Lac, Switzerland. It is a splendid new yacht with 15m2 extra living space. Nasta Marine organised an invitation-only VIP evening followed by two open days to present the latest model to the public. The guests at Nasta Marine agreed with us: this boat is a really new Linssen and is being received very enthusiastically. And now the boat show season is underway. The HISWA Amsterdam In-Water Boar Show takes place the first week in September, followed by Southampton, Friedrichshafen and the now familiar Cruise Days at Hennings in Papenburg. You can already sense the boat show atmosphere. The next events are the sailing days in Maasbracht, Hanseboot in Hamburg and the Nieuwpoort boat show. Consequently, ‘my’ sales department has work on its hands. I will be enjoying the fourth generation for another three weeks before returning to focus on ‘those little Linssen boats’ as Mathijs, our three-year-old son, puts it. We are fast approaching our large anniversary show on 22, 23 and 24 November. We will be presenting two world premieres (Grand Sturdy 52.9 AC Wheelhouse and Classic Sturdy 42 Sedan), one new model (the Classic Sturdy 36 Sedan Deckbridge) and two special editions (30.9 AC and 40.9 AC Brilliant Edition, as part of our brilliant anniversary) in the showroom. So there’s enough work to be going on with! I hope we can meet many existing and new ‘family members’ in late November in Maasbracht!